Sustainability, which has become a bit of a business buzzword, is largely misunderstood. In the rush to promote their sustainability credentials, corporations are looking more at marketing, communications and social engagement, and less at the many opportunities available to them to move towards a more sustainable future. The current reality is that sustainability is corporate code for enhancing social licence. Capitalism – for all its faults – may be our best chance to meet the needs of the present, without compromising the ability of future generations to meet their own needs. As governments ponder our collective future, businesses need to answer one pressing question: what exactly is sustainability? Try a little thought experiment: think of all the inputs a business has across its entire supply chain; then vastly limit the availability of resources. Instinctively, you know what will happen to costs. Run these new, higher costs of business against customer price sensitivity, and ask yourself: would the business survive? This is the complex, contradictory and often paradoxical nature of sustainable development. The current models and frameworks (e.g. Industrial Ecology, Natural Capitalism, Cradle-to-Cradle Design and The Natural Step) while important, take knowledge and significant business investment to implement. While corporations can hire consultants to lift their organization on to a more sustainable path, what are small to medium-size enterprises – which makes up 95% of all business in OECD countries – to do? As a business founder, I’ve been puzzled by the lack of a simple and practical formula for achieving corporate sustainability, one that can be incorporated into the day-to-day activities of time-poor smaller enterprises. So I decided to research and design one. The result: a framework that allows an organization to steer itself towards sustainability. I call it the Sustaining Loop. The framework synthesises years of complex research and theorising by leading academic thinkers into a set of easy-to-understand benchmarks that reliably define what it really means to be a sustainable company. These benchmarks allow organizations to establish their current “sustainable worth”, highlight areas of improvement and see future opportunities. Below is the list of benchmarks that come up time and again in the academic literature and form the core principles underlying the Sustaining Loop framework. It is no good, though, to pay lip service (or print a nice brochure) to achieve any of these benchmarks. The future of businesses depends on getting this right. In this area of the sustainability research, the key values are interconnectedness, diversity, human sustainability and quality of life. What this means is that for too long business has perceived itself as detached from society and the natural world, engaging only when resources are required or sales need to be made. Successful future enterprises will prefer full-body immersion. This will require adopting a strong and clearly defined corporate and ethical position based on a multiple stakeholder perspective. In these leading organizations, systems thinking will rule. It will no longer be a story of “them and us”. The new narrative will be that we are all here together, deserving a better quality of life, today and into the future. Academics have amassed volumes concerning this concept over the decades. Eco-innovation is a major theme in the literature tied strongly to the ideas of moving beyond compliance, embracing smallness and stewardship of resources. As mentioned above, interconnectedness with society and the natural world for the sustaining corporation will be innate, pre-designed. The environment is treated as integral to a viable and generative sustainable economy and ecological innovation will not just be the right thing to do but will offer enormous competitive opportunities. These new, prosperous businesses will find it blindingly obvious that their future is a fragile as the Earth, our only home. In realizing the ultimate value of our shared home, business will take responsibility for facilitating the emergence of a sustainable society. To this end, the sustaining corporation will bring pressure to bear on politicians, governments, communities and stakeholders. In extension, the sustaining corporation will find it logical to value and devote a “spare chair at the board table” to represent the long-term impacts of all corporate decisions. Great leaders will realize that sustaining organizations will have the advantage of attracting the best talent. This talent will be innovative, purposeful and able to find meaning in their work. Responsible and proactive leadership will be diffused through these organizational communities with values codified, setting the tone throughout the organization. Together they will want to make a difference. 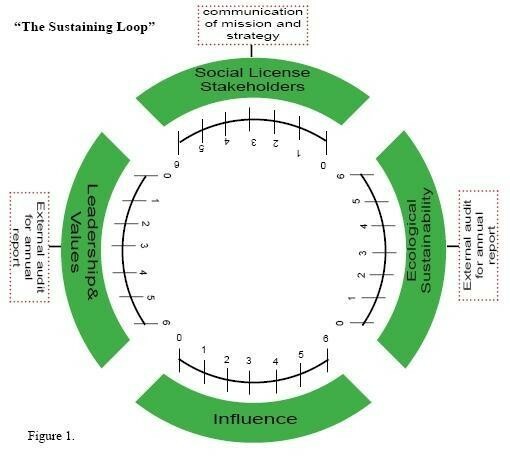 To rate its performance, an organization should examine the Sustaining Loop benchmarks (points 1-4, above) assess its current position and give itself a score out of six (this can also be done more formally by external experts). A rating of six indicates full achievement of all area descriptors. The ratings are not intended to be definitive, but a way of assigning a notional value that can frame efforts and discussions as the business moves towards more sustainable practices. Recommended actions in terms of reporting and communication are depicted against relevant quadrants.